What is the Best Electric Binding Machine for Wire? When we talk about the "best" of anything, we consider several important factors. For one, we look at the quality of the machine; it needs to withstand the intended volume set forth by the manufacturer, and gets bonus points for handling more. The materials and construction, as well as the manufacturer's warranty also play into this. Next, we look at the functionality and ease of use; does it have all the necessary features to produce a good finish, as well as allow for adjustments for different users and applications. Are these adjustments easy to use and accurate. We also look at the popularity of the machine; how many people are purchasing a specific unit tells us a lot about what customers prefer and what works best for them. Lastly we look at the value; this is not just the price itself, but how much value is provided within that price. Typically the best is not the most expensive machine out there, nor it is the cheapest. The Akiles WireMac-EX was built especially to fit into a niche group of companies that wanted the convenience of electric punching, but never had the volume to warrant spending the extra money to invest in an electric machine. It is a unique mid-volume electric wire punch, whereas most electric punches are for high volume. The wire closer featured on this unit is still manual, activated by a handle. It has all the same great adjustment capabilities as other Akiles machines, which mean you can adjust your hole depth and margin size, as well as set the closer to an accurate size to help you achieve a perfectly round wire. It also features that standard Akiles warranty of 1 year. One major benefit of the WireMac-EX is the fully disenageable pins. Most people new to wire binding don't know what this means, nor how much value it adds to the machine...so let me simplify it. Each individual pin punches each individual hole. The ability to stop one (or more) pins from punching lets you customize the punch pattern and punch special sheet sizes without worrying about half-holes. The only negative we have found with this machine is that it is a one-pitch-only machine, meaning you would choose whether you want a 3:1 or 2:1 pitch for the punching pattern. Depending on the book thickness you typically work with (and plan to work with in the future) this can limit some users a bit. The only way to get a high quality electric wire binding machine that will do both 3:1 and 2:1 will require a higher-volume and multi-functional machine (see our other top machines below). Keep in mind that if you are working with high volumes that warrant an investment into a more capable machine, it is important that you buy one of those instead. This WireMax EX electric wire binder is meant for lower to mid-volume use only. The motor is not built to handle high production volumes. Akiles also manufactures an electric wire machine for higher volume users, called the WireMac-E (E for electric). It is built with high quality parts and a durable motor to handle the higher volume punching needs of large offices with daily binding needs. This unit has all of the standard features of an Akiles machine, which include the fully adjustable margins and punching pins, as well as the 1 year manufacturer's warranty. The punching is electric, but the wire closing is still manual. It is simple to get that perfectly round wire, though, with the wire closer adjustment settings; just set it to the size of wire you are using to achieve the perfect finish. Just like the EX, the WireMac-E has fully disengageable pins as well so you can customize the punch pattern and stop those annoying half-holes on the end of your sheets. Just like the EX, this electric wire binder is available in either a 3:1 or a 2:1 pitch model, so you choose which will fit for your business better. It will not accomplish both with the same unit. And our number 1 electric wire binding machine is the Rhin-O-Tuff HD7700. Officially, this machine is a multi-functional punch, meaning that it will actually work for both 3:1 and 2:1 pitch wire, as well as other binding styles like spiral coil, comb, and more; you just need a different die for each pattern. This versatility is a huge perk, and the best way to accomplish both wire binding punch patterns in a high volume machine like this. This is an incredibly durable wire binder punch that will produce perfectly punched holes through thicker stacks of paper than most others, while still being compact and table-top for smaller spaces. They are the only binding machines that are currently made in the USA, adding a quality and durability not found in any others. In fact, the HD7700 is the top choice for print and copy shops. The HD7700 has a 3 year manufacturer's warranty from Rhin-O-Tuff, which is the longest in the industry. They truly believe in their products, as do we. One thing to note, however, is that this is a punch-only electric wire machine, so you would need to add a wire closer to finish your bind. Our preference when working with volumes that warrant this great wire punch machine is the FlexiCloser; a truly awesome electric wire closing machine that eliminates the hassle of pulling that handle, and gets you a perfectly closer wire, every time, no matter the wire size. 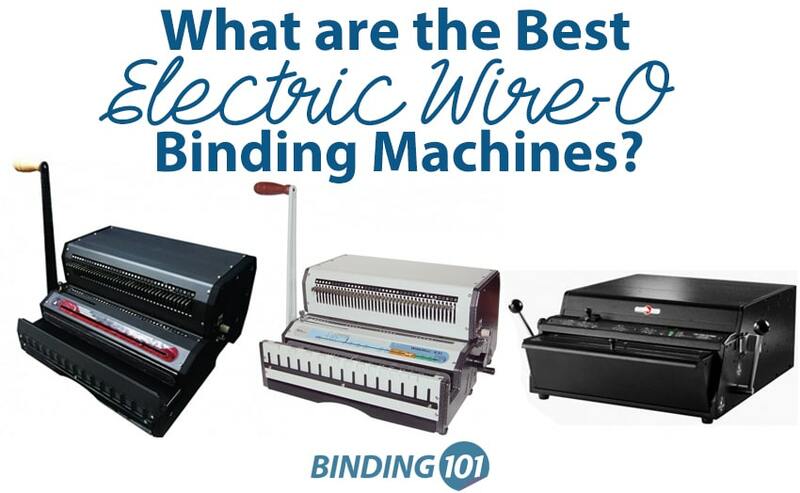 So what kind of electric wire binding machine do you have? Do you have one of these 3 great machines, or a different one? Send me your opinion to mallorym@binding101.com for a chance for your business to be featured in our blog and on social media.